amiro art galleries: Artober Fest is coming! October 5 First Friday Art Walk. The harvest is in and that means it's time for Artober Fest, a celebration of an eclectic collection of art and the artists who create it. Artober Fest will be held during the October 5 First Friday Art Walk from 5:00p.m. until 9:00p.m. 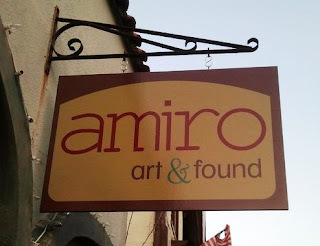 at Amiro Art & Found located at 9C Aviles Street in Saint Augustine. Featured artists Ginny Bullard, Estella Fransbergen, Deane Kellogg, Wendy Mandel McDaniel, Jan Tomlinson Master, and Marcia Myrick Siany have brought in their summer crop of work and it's time to step back, admire, and enjoy the harvest. Stroll down Aviles Street and stop in Amiro to enjoy a spot of beer. You might even hear a polka or two as you visit with the artists and view their artwork.